You heard right! 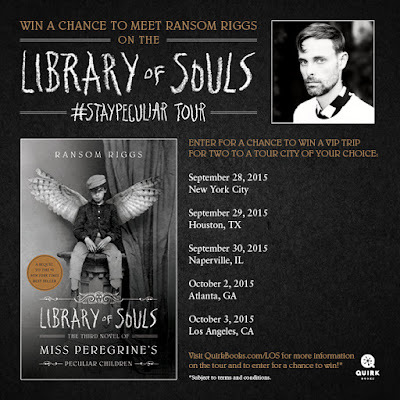 The fabulous Ransom Riggs is going to make FIVE stops this fall with special guests and everything. Sign my books, take my money, hugs for all! Not stopping in your town? That's okay, because the amazing people at QuirkBooks are giving away a VIP trip for two to any stop of your choice. 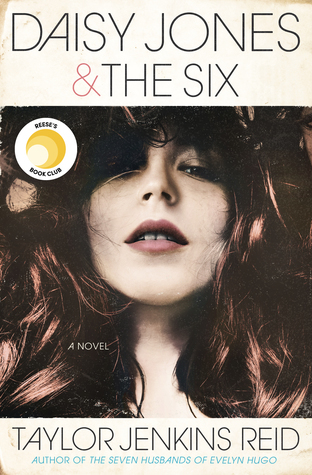 Ever wanted to visit the Big Apple or hang out with all of the stars (Ransom included) in LA? Here's your chance! All you have to do is snap a photo of yourself in your most peculiar costume and send them the link (www.quirkbooks.com/los). Really, it's that easy. 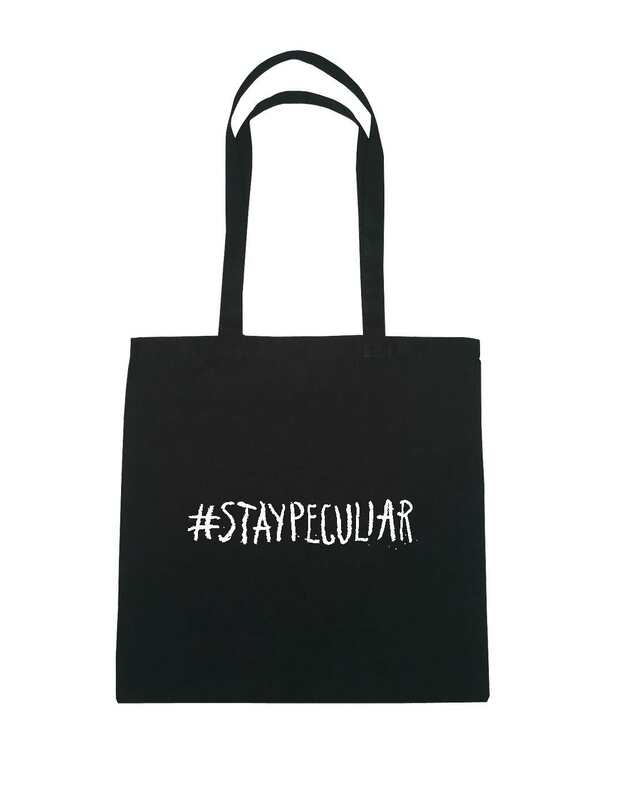 Don't forget to use the hashtag #StayPeculiar. 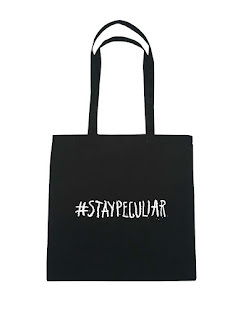 Now, while we wait for Ransom to pack his bags and get moving, I'm giving away a #StayPeculiar tote courtesy of QuirkBooks. This giveaway is only open to US participants. You're going to need something wicked to carry all of your Miss Peregrine's books in, am I right? Good luck, and may the odds be ever in your favor. I fell in love with his books. I love that he has photographs to go along with the story. Never know what will happen next. Love his books...I can't wait to read more. His books are unique and easy to enjoy. LOVE HIM!!! I haven't read his books yet...look great though! 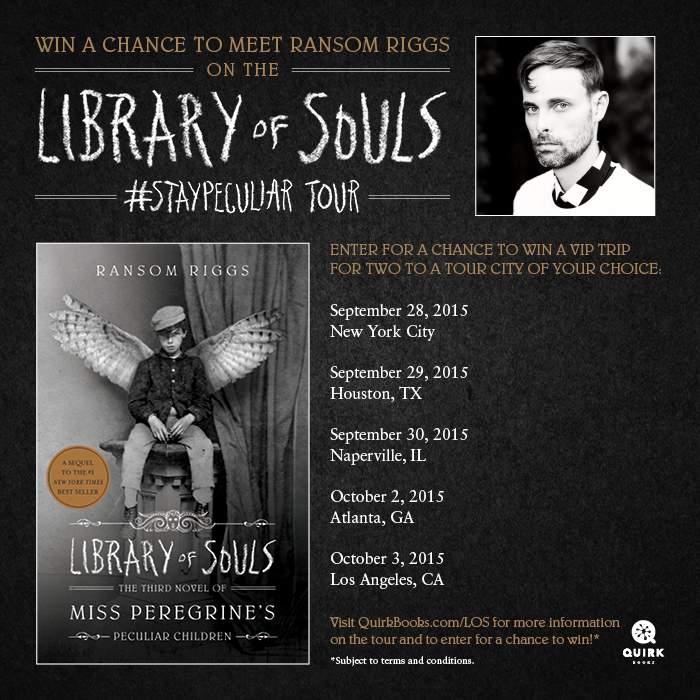 I love Ransom Riggs! When it he was first published his book and I couldn't buy it and had to wait for my library to get it I was so happy with it but with the end I was crazy sad but learning the news there will be a second and now a third with a movie. Never read anything by Ransom Riggs before, but his work sounds really good! I love Ransom Riggs! Thanks for the giveaway! This is a really interesting page, that's why I want to make compliments to the administrator. We must admit that this article is one of the best I have read. I appreciate your work and wish you many more successes in the future. Is a good book indeed ,thanks for aticle and for adding my comment. Kencing Terasa Sakit Dan Keluar Nanah Apa Itu Gejala Penyakit Gonore? Very addictive blog and article, visit my website for funny skill games to friv.ws, and enjoy games in the browser on any device you like. Thanks, your blog has cool articles.